Here’s a versatile, sweet, and savory recipe for your favorite root veggies. Try it as an accompaniment to the mustard-baked chicken with pretzel crust. Peel carrots. Cut vegetables into bite-size pieces, toss with EVOO and salt and pepper. Roast at 400 degrees for 15-20 minutes. Meanwhile, over low heat melt butter and syrup, EVOO, and sage. Remove veggies from oven and pour syrup mixture over veggies. 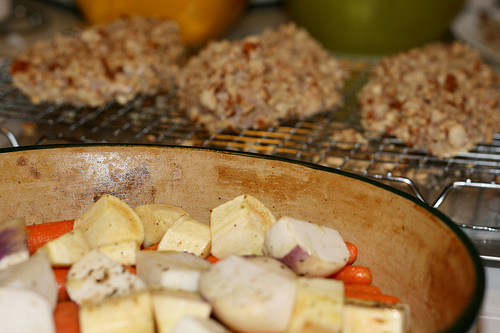 Return to oven for 15-20 minutes or until syrup is bubbly and vegetables are tender.